Q: How do you feel about the win? A: I’m just over the moon and I hope that it will encourage more of us to write for our children. At the same time, I should add that the judges were keen to stress that they didn’t consider this a children’s book because of its appeal to adults. They called it a story that was written from the perspective of youth. But I’m still enthusiastic and hopeful that this won’t discourage other children’s writers. The beauty of writing for older children is that you don’t need to leave your adult readers out in the cold. If you look at classics like The Hobbit and even Harry Potter they were written primarily for children but took the adult world by storm. I’m not comparing Mythil’s Secret to these books – just trying to point out that if you write for older children in a way that isn’t too preachy or moralistic you can straddle the divide between children’s and general literature for grownups. Q: What got you writing children’s books? A: The books I read as a child were set in Britain and America. Even the fantasy stories I read were western-inspired. I treasured these stories. But at the same time if I tried to imagine myself in them I had to change who I was. 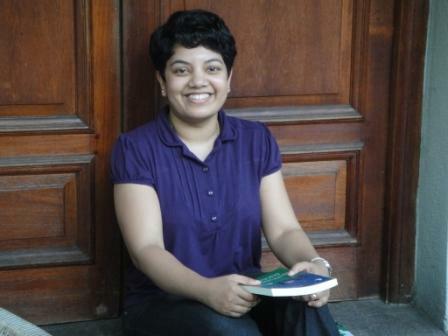 I couldn’t enter those worlds as me, a Sri Lankan child, because I knew I wouldn’t fit in. I longed for Sri Lankan stories or stories written for older Sri Lankan children. Stories that were modern, complex and exciting. Not moralistic tame stories about good children who always did the right thing. I couldn’t find many so I thought I’d write some myself. Mythil’s Secret has been a good start. Q: What age group of kids are we talking about? A: The pre-teen to early teen age group – during the writing process I depended on a group of friends to give me feedback and all but one of them, Shehan Peiris, were over 18! So while I know it appeals to adults, I am hoping it will appeal to the 9-14 age group too – I’ve yet to hear back from them. Q: You started work on Mythil’s Secret 8 years ago, what took so long? A: Well, I’ve been scribbling stories practically all my life and even though I always got excited about each story they never stood the test of time. Three or so months later it would either bore me or I’d think, ‘oh hang on a minute this plot is almost identical to something else I read’. But when I applied the same test to Mythil’s Secret I wasn’t bored by it. I think it’s important to take time over a book. For me anyway. Because when I’m writing it’s an emotional experience. I’m not always looking at the text critically. That needs to happen after I’ve put the story away and almost forgotten it. Once I had a draft I was happy to show people. I showed it to as many trusted friends as I could blackmail into reading and reviewing it. This takes time too. Badgering them. Waiting till they read it. Waiting till they think about it. Waiting till they write down their comments. And then more time for me to read their feedback and decide which to act on and which to ignore. All this means several rewrites; several drafts. Also I didn’t have money to pay for publishing this book. Ameena and Sam of Perera and Hussein Publishers decided it was worth investing in. So we worked on the book in between their regular publications. They asked all the tough questions that I wouldn’t have thought of and again this process took several drafts too. Q: Who inspired Mythil’s character? A: I don’t know. He just appeared on the fringes of my imagination. I didn’t even know his name. But he started telling me his story. It was just the barebones of a story at that point. It only took 36 pages when written down. Looking back now I think there’s a lot of me in him. But in the end he turned out to be much braver than I ever was at that age. Q: You touch on a range of family issues; is Mythil and his family a reflection of today’s average Sri Lankan city family and child? A: I don’t know what the representation of today’s average Sri Lankan child would be like but I do think that in a nuclear family where both parents must work and a child has no siblings or other family members to interact with he or she could get quite lonely. Mythil is bored at the start of the story because Archchi is asleep, his parents want a private moment to talk and Seeli is busy with her chores. But when Archchi is awake he’s not bored at all – he enjoys spending time with her – even if it’s making wattakka pudding together. Archchi and Mythil are the best of friends. And I think it’s important for a child to have a family member they can trust and spend quality time with. Archchi is the only adult who does not make Mythil feel as though something must be wrong with him. Even when she advises him (when she tells him he has a better chance of defeating yakas with his intelligence rather than the traditional iron) she doesn’t judge him. Q: Do you think our local folklore has the potential to grab the imagination of our slightly westernized kids? A: Folklore has stood the test of time so, yes, I think there’s lots of potential there. Our local tales certainly fired my own imagination. I can’t quite remember how I first heard of yaka lore but I’ve always been fascinated by myths and folktales – Greek, Russian, English, Sri Lankan – it didn’t matter where they came from. They’re all such great stories! Q: Did you grow up with tales of yakas? A: Not really, although these stories were in our Sinhala Literature text books. Yakas weren’t part of my imagination as a child, nor did I have a Seeli in my childhood to tell me scary stories. Q: How perceptive do you think today’s Sri Lankan children are to local folklore? If you’re asking me to speculate I would imagine that our city children would be more familiar with Harry Potter and Ben Ten than Mahasona or the Reeri Yaka but that’s just a guess. Is the story too alien to Sri Lankan children because there aren’t many stories about yakas in English? I don’t know but as I said I’d really like to hear from younger readers themselves through the Mythil’s Secret blog. The yakas in Mythil’s world have evolved with the times, so they’re quite different to the yakas we have come across in old folktales. Hopefully today’s young readers will find them intriguing. Q: What books did you enjoy as a child and what authors do you enjoy today? A: Stories that featured families. Adventure stories, mysteries, folk tales and fairy tales. Authors I enjoy today are the same authors I turned to as a child like Enid Blyton, Richmal Crompton and E Nesbit, as well as more modern writers like Jonathan Stroud, Diana Wynne Jones and Jacquelin Wilson – to name a few. A: As I said the book took 8 years to write so yes, there were times when I was discouraged and frustrated. I wondered who I was fooling. I wondered whether readers would just hate my work. That’s why I turned to my friends to get their opinion. But the one person who’s been my strength throughout the whole process is my husband Harshana. He’d push me to finish a draft over a weekend. He’d talk me into believing in myself and chasing after my dream again. I couldn’t have done it without him. One thing I didn’t have to worry about was rejection letters from publishers. My ‘machang’ Ruwanthie de Chickera introduced me to Ameena Hussein and she and her husband Sam Perera read that early draft and decided to invest in the book. If it wasn’t for Ruwanthie I don’t know whether I would have believed in myself enough to speak to other publishers. Q: What perspective does being a parent give you in writing children’s literature? A: My daughter was born one month after Mythil’s Secret was published. So I wasn’t a parent while writing the book. I guess I’ve always been a child at heart so this book was written from the perspective of the child and not his parents. Q: A lot of writers struggle with rejection, mixed reviews and their own insecurities; have you ever had to deal with any of the above and if so, how? A: I’ve been blessed with a very supportive family and friends so that was one hurdle I didn’t need to overcome. After the book was published it was discussed at a book club in Colombo and I was very nervous about what would be said about it because this was the first time that people I didn’t know were reviewing the book. One of the readers, an adult, said it was boring and my heart sank. Another said it was far too scary for children. The other adults had mostly good things to say about the book although they felt that the tying up of loose ends towards its close took too long. But then the only two children in the club spoke up and said they’d just loved the book and I just sighed in relief! Q: What are your goals for the future? Got another story on the boiling pot? A: At least two more yes but at the moment they’re safely locked in my head. So perhaps in another eight years?